This Signature Bling t-shirt was designed for the ladies of Alpha Kappa Alpha Sorority, Inc. for a specific HBCU. 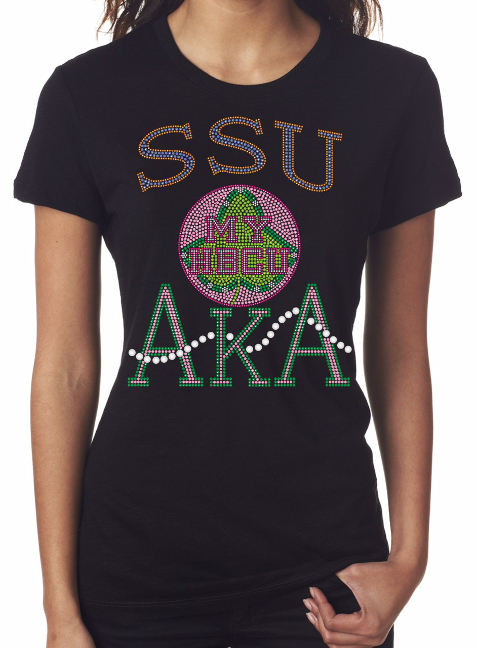 This black blue t-shirt is adorned with collegiate colors, and pink and green crystals and simulated pearls running through the AKA. Sorors who are proud of their HBCU, as they beam with pride as they wear this t-shirt! Spread the word, this t-shirt is being offered for a limited time only so get yours now! NOTE: Volume orders can take up to 4-6 weeks for delivery. The shirt is a MISSES FITTED Cut. Please see the sizing chart below.